Lignite distinctive in floristic composition. 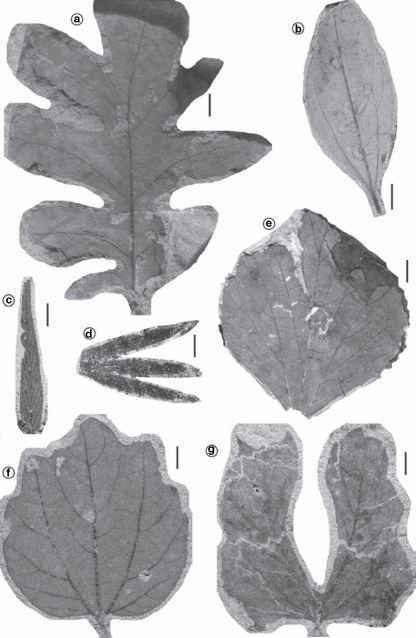 The FU0 megaflora, which is of latest Maastrichtian age, is composed largely of plants of Paleocene aspect, along with a few species known only from the Maastrichtian. The palynological record at the New Facet Boundary locality verifies the Maastrichtian age of the FU0 megaflora. Its discovery and interpretation suggest that the Paleocene megaflora of the region is composed of Cretaceous mire vegetation that survived the K-T boundary event. Such survivor plants from Maastrichtian mires became widespread in Paleocene time, and the FUI megaflora is present in all Paleocene facies above the boundary. Note that occurrences of spores and gymnosperm pollen as well as angiosperm pollen are plotted in Figure 6.25 and that the stratigraphic position of the FU0 megaflora (DMNH 2103) is indicated.